It is a good sign that you are in the right business when you get tremendous satisfaction from your career – whether it be from the daily challenges at work, or through professional growth, learning, or sharing. It’s been an exciting month for me, as I’ve taken a few steps to get more involved. First, I decided to submit my application for the 2013 VMware vExpert program. I’ve sat on the sidelines, churning out blog posts for 4 years now, but with the encouragement of a few of my fellow VMUG comrades and friends, decided to put my hat in the game with others equally as enthusiastic as I am about what many of us do for a living. The list has not been announced yet, so we’ll see what happens. 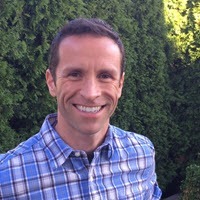 I’m also now officially part of the Seattle VMUG steering committee, contributing where I can to provide more value to the local VMUG community. Next, I was honored to be recognized as a 2013 Dell TechCenter Rockstar. Started in 2012, the DTC Rockstar program recognizes those Subject Matter Experts and enthusiasts who share their knowledge on the portfolio of Dell solutions in the Enterprise. And I am flattered to be in great company with the others who have been recognized by their efforts. Congratulations to the others who were recognized as well. This session was inspired from part 1 and part 2 of “Vroom! Scaling up Virtual Machines in vSphere to meet performance requirements.” What transpired from the project was a fascinating exercise in assumptions, bottleneck chasing, and a modern virtualized infrastructure’s ability to scale up computational power immediately for an organization. I’ve received great feedback from those posts, but the posts just skimmed the surface on what was learned. What better way to demonstrate a very unique use-case than to share the details with those who really care. Take a look out at: http://www.vmworld.com/cfp.jspa. My submission is under the “Customer Case Studies” track, number 4730. Public voting is now open. If you don’t have a VMworld account, just create one – it’s free. Click on the session to read the abstract, and if you like what you see, click on the “thumbs up” button to put in a vote for it. Spend enough time in IT, and it turns out you might have an opinion or two on things. How to make it all work, and how to keep your sanity. I haven’t quite figured out the definitive answers to either one of those yet, but when there is an opportunity to contribute, I try my best to pay it forward to the great communities of geeks out there. Thanks for reading. There are a number of things that I don’t miss with old physical infrastructures. One near the top of the list is a general lack of visibility for each and every system. Horribly underutilized hardware running happily along side overtaxed or misconfigured systems, and it all looked the same. Fortunately, virtualization has changed much of that nonsense, and performance trending data of VMs and hosts are a given. Partners in the VMware ecosystem are able to take advantage of the extensibility by offering useful tools to improve management and monitoring of other components throughout the stack. The Dell Management Plug-in for VMware vCenter is a great example of that. It does a good job of integrating side-band management and event driven alerting inside of vCenter. However, in many cases you still need to look at performance trending data of devices that may not inherently have that ability on it’s own. Switchgear is a great example of a resource that can be left in the dark. SNMP can be used to monitor switchgear and other types of devices, but it’s use is almost always absent in smaller environments. But there are simple options to help provide better visibility even for the smallest of shops. This post will provide what you need to know to get started. In this example, I will be setting up a general purpose SNMP management system running Cacti to monitor the performance of some Dell PowerConnect switchgear. Cacti leverages RRDTool’s framework to deliver time based performance monitoring and graphing. It can monitor a number of different types of systems supporting SNMP, but switchgear provides the best example that most everyone can relate to. At a very affordable price (free), Cacti will work just fine in helping with these visibility gaps. The first thing to do is to build a simple Linux VM for the purpose of SNMP management. One would think there would be a free Virtual Appliance out on the VMware Virtual Appliance Marektplace for this purpose, but if there is, I couldn’t find it. Any distribution will work, but my instructions will cater toward the Debian distributions – particularly Ubuntu, or a Ubuntu clone like Linux Mint (my personal favorite). Set it for 1vCPU and 512 MB of RAM. Assign it a static address on your network management VLAN (if you have one). Otherwise, your production LAN will be fine. While it is a single purpose built VM, you still have to live with it, so no need to punish yourself by leaving it bare bones. Go ahead and install the typical packages (e.g. vim, ssh, ntp, etc.) for convenience or functionality. Templates are an option that extend the functionality in Cacti. In the case of the PowerConnect switches, the template will assist in providing information on CPU, memory, and temperature. A template for the PowerConnect 6200 line of switches can be found here. The instructions below will include how to install this. In the simplest of configurations (which I will show here), there really isn’t much to SNMP. For this scenario, one will be providing read-only access of SNMP via a shared community name. The monitoring VM will poll these devices and update the database accordingly. Option 1: Connect a dedicated management port on your SAN switch stack back to your LAN switch stack. Option 2: Expose the SAN switch management VLAN using a port group on your iSCSI vSwitch. I prefer option 1, but regardless, if it is iSCSI switches you are dealing with, you will want to make sure that management traffic is on a different VLAN than your iSCSI traffic to maintain the proper isolation of iSCSI traffic. Once the communication is in place, just make a few changes to your PowerConnect switchgear. Note that community names are case sensitive, so decide on a name, and stick with it. Perform the following steps on the VM you will be using to install Cacti. 4. Restart the snmpd daemon. 6. Perform the following steps on the VM you will be using to install Cacti. During the installation process, MySQL will be installed, and the installation will ask what you would like the MySQL root password to be. Then the installer will ask what you would like cacti’s MySQL password to be. Choose passwords as desired. Now, the Cacti installation is available via http://[cactiservername]/cacti with a username and password of "admin" Cacti will now ask you to change the admin password. Choose whatever you wish. 8. Import the host template via the GUI interface. Log into Cacti, and go to Console > Import Templates, select the desired file (in this case, cacti_host_template_dell_powerconnect_62xx_switch.xml), and click Import. 9. Copy the 62xx_cpu.pl script into the Cacti script directory on server (/usr/share/cacti/site/scripts). This may need executable permissions. If you downloaded it to a Windows machine, but need to copy it to the Linux VM, WinSCP works nicely for this. You are now ready to run Cacti so that you can connect and monitor your devices. This example shows how to add the device to Cacti, then monitor CPU and a specific data port on the switch. 1. Launch Cacti from your workstation by browsing out to http://[cactiservername]/cacti and enter your credentials. 2. Create a new Graph Tree via Console > Graph Trees > Add. You can call it something like “Switches” then click Create. 3. Create a new device via Console > Devices > Add. Give it a friendly description, and the host name of the device. Enter the SNMP Community name you decided upon earlier. In my example above, I show the community name as being “mycompany” but choose whatever fits. Remember that community names are case sensitive. 4. 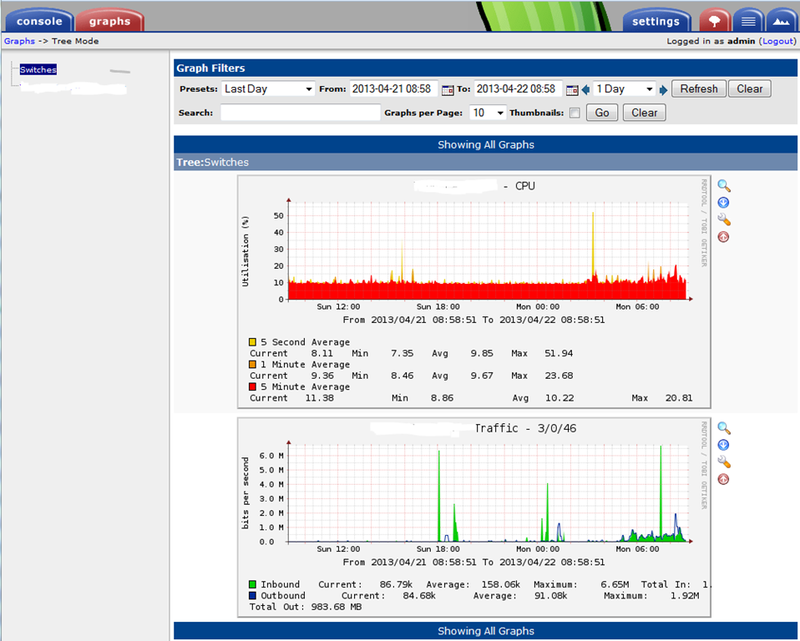 To create a graph for monitoring CPU of the switch, click Console > Create New Graphs. In the host box, select the device you just added. In the “Create” box, select “Dell Powerconnect 62xx – CPU” and click Create to complete. 5. To create a graph for monitoring a specific Ethernet port, click Console > Create New Graphs. In the Host box, select the device you just added. Put a check mark next to the port number desired, and select In/Out bits with total bandwidth. Click Create > Create to complete. By clicking on the magnifying glass icon, or by the “Graph Filters” near the top of the screen, one can easily zoom or zoom out to various sampling periods to suite your needs. Using SNMP and a tool like Cacti can provide historical performance data for non virtualized devices and systems in ways you’ve grown accustomed to in vSphere environments. How hard are your switches running? How much internet bandwidth does your organization use? This will tell you. Give it a try. You might be surprised at what you find.